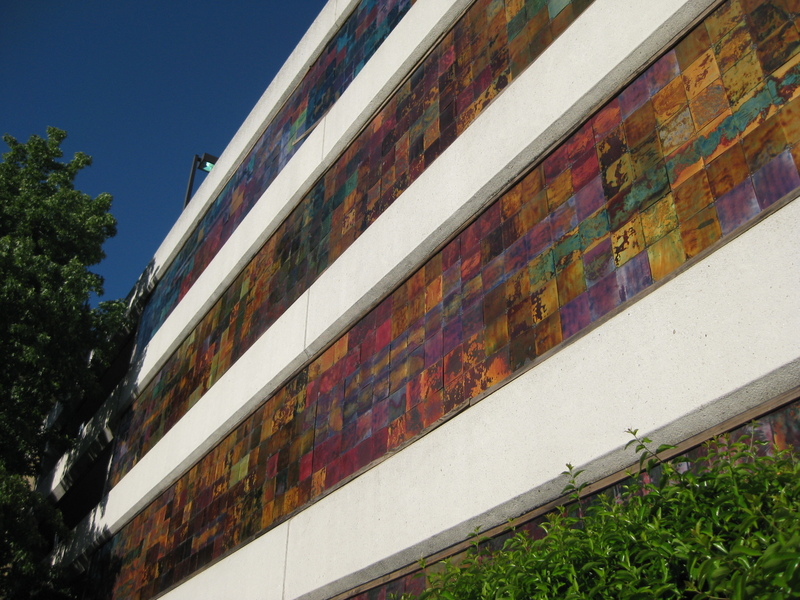 This beautiful mural, called The Way Home, is installed on the side of a parking garage along the western edge of downtown Sacramento and visible travelling along highway 5. 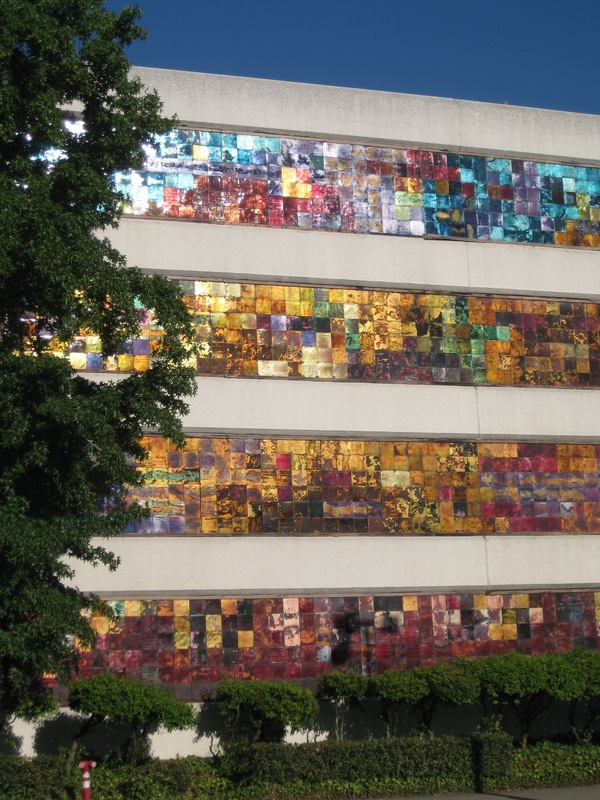 Fred Uhl Ball created the mural using enameled copper tiles between 1977 and 1980 (1). Views of the Sacramento River Delta inspired this work, and the range of colors “reflect the [Delta’s] various seasons” (2). 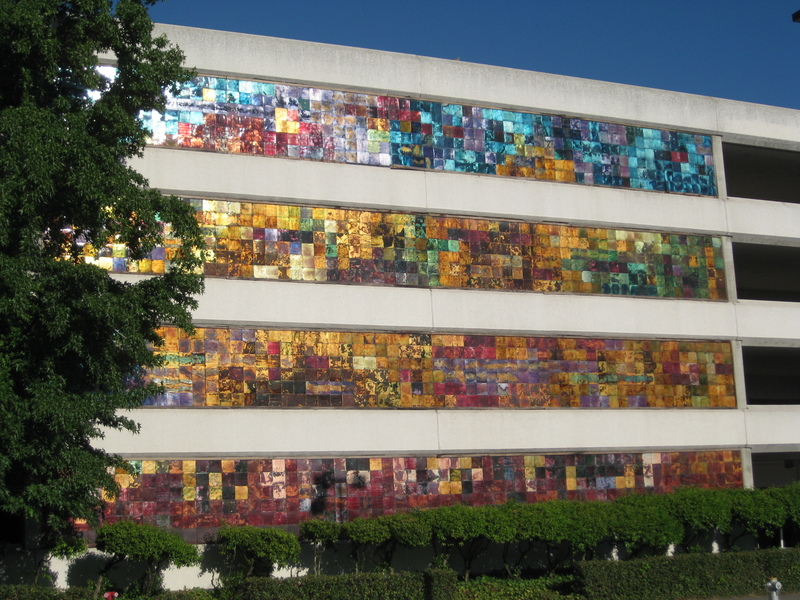 There are four sections to the mural, each 6’ x 62’, and a total of 1,488 tiles (3). The tiles give quite a different impression from a distance than they do close up. The Enamel Arts Foundation displays wonderful photos of some of Ball’s other works here, Fred Ball Enamels. Considered one of the most innovative artists working in the 20th-century enameling field, Fred Uhl Ball (1945 – 1985) was the son of the prominent ceramist F. Carlton Ball (1911 – 1992) and the designer, graphic artist, enamelist, and educator Kathryn Uhl Ball (1910 – 2000). After studying traditional enameling techniques with his mother, the precocious young artist exhibited his work and gave enameling demonstrations at the California State Fair in Sacramento in 1956 when he was only eleven. Two years later in 1958, in response to his mother’s urging to make something he’d never seen before, Ball began his lifelong commitment to experimentation. 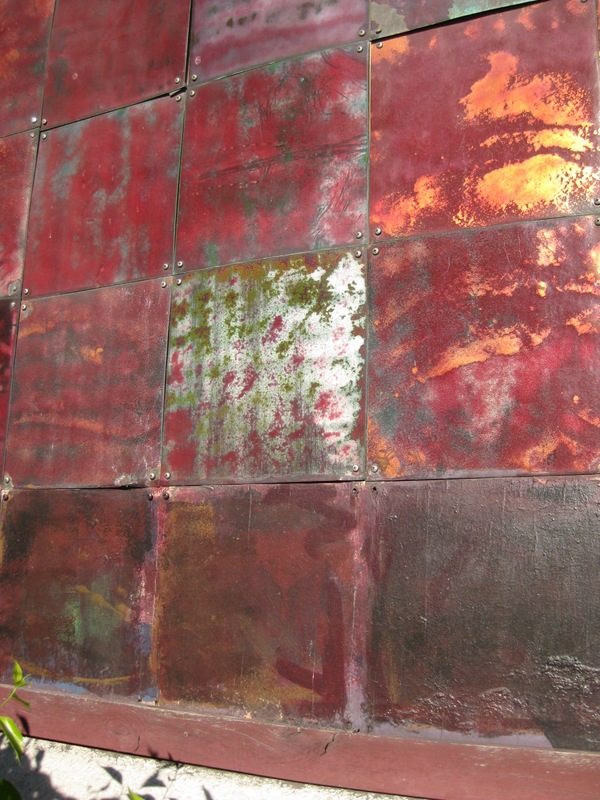 Viewed as highly unorthodox at the time, his experimental techniques which include torch firing, metal collage, conscious exploration of fire scale, and use of liquid enamel materials, are admired today by many of the foremost leaders in the field. He is one of the artists credited with transforming enameling from its traditional association with small size and preciousness, to an epic scale consistent with Postwar painting and sculpture (4). One September evening in 1985, he was leaving his studio–a loft space in downtown Sacramento when he was attacked by thugs, robbed, pushed down the stairs, and left unconscious on the street. His neck was broken and he was left totally paralyzed. Taken to the hospital, he was stabilized, but needed to be on a respirator. He could only blink his eyes to communicate. He had several commissions starter for which he had already purchased materials. In the succeeding months, his mother, and a young man who was Fred’s assistant, completed these large jig-saw like works. They would bring the portions they were working on and show them to Fred, asking questions and pointing to letters. He would respond with “yes” or “no” blinks… Fred died that December from complications of his injury. His mother (at age seventy-five and in poor health), with the help of Fred’s assistant, completed all his commissions in the months following his death (5). The collaboration of Ball’s mother, assistant, and friends, to complete the works he had started prior to being paralyzed is quite moving to me. I have been visually interested in this mural for years. Learning about the artist and his history gives me another way of relating to and respecting this work. Discovering that the images are drawn from the landscape of the delta region was not surprising because I have always been similarly affected by the colors and shapes of that terrain. I’m feeling quite grateful for Ball’s creativity and ability to actualize his art.